Lien claims must be discharged when the underlying claim is paid or the lien must be dissolved for any other reason provided by law. To accomplish this, the claimant records a discharge of lien document in the Register of Deeds in the county where the property is located. The lien is officially released after recording this form. 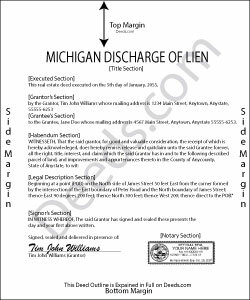 The discharge of lien form contains the following information: (1) lien claimant's name, (2) amount of the lien claim, (3) the book and page number where the recorded lien claim can be found in the county register of deeds, (4) property owner's name, (5) legal property description, and (6) common name of the property. Take care when discharging the lien, because once the lien has been officially released, the claimant loses a valuable tool to coerce payment. This article is provided for informational purposes only and should not be relied on as a substitute for the advice of an attorney. Please consult a Michigan attorney with any questions about discharging a recorded lien claim, or any other issues related to liens. Mark R. said: Easy and simple to understand, had no trouble with the transaction or the forms. Recorded on the first try, not something that happens very often. Reply from Staff: Great to hear that Mark. have an awesome day! Ben F. said: My initial review during download and before reading the guide and forms looks promising. Esther R. said: Very easy to follow and complete. Martha B. said: Not too hard to do, I did get it checked out by an attorney after I completed it just to be safe. He said it was fine, made no changes. Lenore B. said: Thank you for making this deed available. The guide was such a big help. Reply from Staff: Thanks Lenore, have a great day!